By randomly taking a look at any duty instruction, we will certainly find a section there, which with a certain degree of "un-clarity", requires the following qualities from the employee "honesty", "attentiveness", "organization skills, “works without faults” and even "punctuality". It is required from the head of the water supply department that water flows constantly when the tap is opened (furthermore, the water should have the required temperature and an adequate composition); it is required from the dispatcher of a bus parking lot that the buses get the passengers on time; from the drivers that they follow the rules and regulations set for the lubricants, wear and tear of the tires and more. Some Companies are more technological than others. Some manage to set the work in such a way that it is very difficult to allow any violation, error or fault. Different electronic systems are installed to report them, "alarms" about an upcoming break-down or insufficient reserves from the stores; bar-coded documents and reports etc. But even with the most perfect technology, people are not completely "picked out". In the same way as cockroaches are not completely exterminated (even with the wide choice of "exterminating" ways) in the kitchen of a Krushchev house (I hope the reader will forgive such a soulless comparison). Errors and faults still happen, and "conflicts" between workers, technologies and machines exist nonetheless. How will a rational salary model help us here? We shall talk about that in the article. It is useful to write down a list of typical violations, i.e. only those which a chronically frequent. Even if they – only by lucky – didn’t lead to something serious. Punish not only those who do wrong, but those who intend to do so. The machinist who sets pumps is fined for firing the electrical motor when a bolt is unscrewed, even if it was without consequences. The mechanic is fined for the reduction of instructed amount of oil in the carter, even if the motor did not get off the system. The heater operator is fined when the heater works with a non-ventilated shaft, even if the heater was not damaged. The secretary is fined picking up the phone after the third tone, even if the caller waited "at the other end of the line". The vendor is fined for old price tags or product "holes" on the shelves of the shop even if the customer demanded the required product from the store. In a Swiss company, employees were obviously, only fined for a typical violation after planes crashed. (It was found out that the instruction was violated about dispatchers working in pairs (one of them went out to have a smoke, and the other confused the planes, and, as a result, the planes crashed; furthermore the telephone lines (again a violation of instructions) were busy)). Let’s agree that the aim of any fine is not to compensate for a loss, but to reduce the probability of repeating the accident. If the loss occurred due to the fault/error of the employee surpasses his salary, then it is our duty to develop a "defense against fools", and not to define the amount of the punishment. There is no not much to gain by defining this amount. The employee will already be scared "to death", but he will not be able to correct the situation. It is obvious that zeroes are to be valorized here and not the marks obtained in the last column. 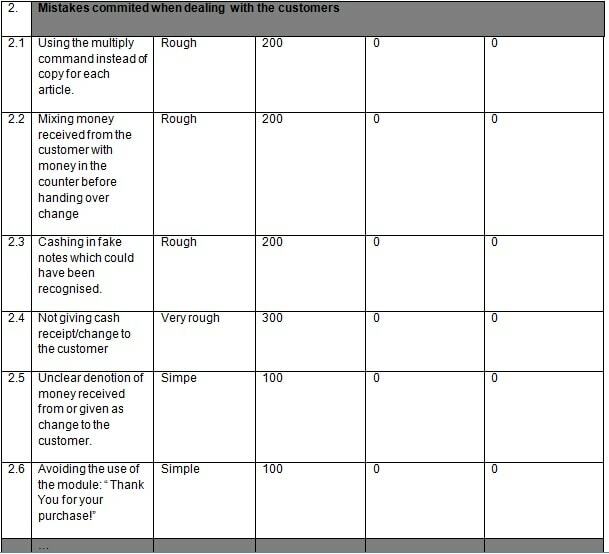 As a result, it is possible to calculate the total value for violations made by each employee. Note 1. We remind you that the salary of an employee (see also. : Kavtreva A. "The article about salary") consists of a constant and a variable part. The given variable (premium) part is reduced depending on the number of violations. It can be set in the beginning in "advance" marks (for example, 266 marks). 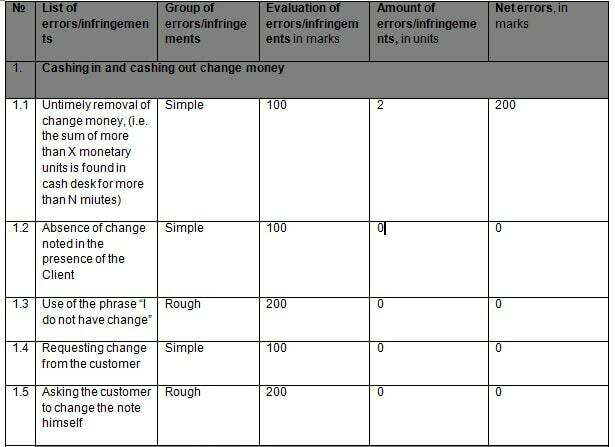 The violations are also calculated in marks – of course, negative ones. (For example: 3 marks х 5 violations = "minus" 15 marks. Total: 266 – 15 = 251 marks.) For each mark, a reward is given, i.e. the marks "are converted" into the money (for example, 1:1 - 251 marks х USD 1 = USD 251). There is an interesting effect: if you stop giving "voice" warnings for violations and faults and start writing them down "on paper", employees start to make them less often. Of course, under the condition that they really require such a punishment. Bad statistics (i.e. frequently getting large marks) show the necessity for improving the process and/or the firing of the stubborn worker. only the dose makes that a thing is no poison. An operator verifies the content of iron in water (the indicators constantly fixes it when it is supplied). Over the whole volume of water supplied, it is easy to know which part corresponded to the given parameters and which part did not. What is understood by the term "not corresponding', is a very small (one tenth of a mg per liter) deviation from the norm; a higher deviation is called a serious unforeseen matter. It is impossible to supply water without any deviation at all (with the existing technology at the enterprise), the whole question is: in which "net" volume is it allowed (i.e. the fault is "accumulated'). If such "accumulations" are up to 5%, then the employee should not be punished but given a reward. 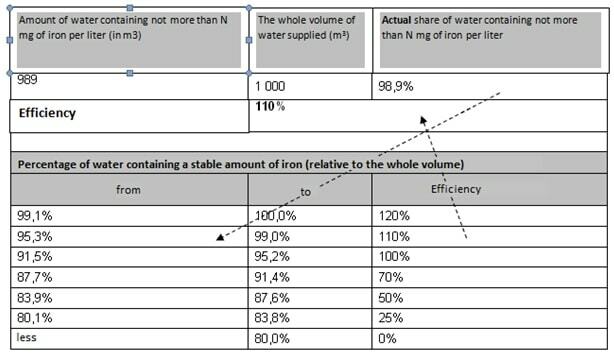 Has the Reader understood how to link the salary of the operator to the volume of water which corresponds to the given parameters? If a volume of work which is quite impossible to fulfil without errors and faults, a linear comparison with the efficiency is NOT possible, then a "Magnifying glass"  can be used. More specifically, a method with that name. For example in one plant, if the share of quality products is 96% of the whole amount it is considered as "excellent" and a result of 92% is a "failure". If we would have used 92% and 96% as criteria of efficiency in our calculation for the premium part of the salary, then the employee would not have seen the difference in his salary for a quality and non-quality work. In order to compare, let’s calculate a premium part equaling to USD 266. 266 х 92% = USD 245 for the lowest (within possible limits) result. 266 х 96% = USD 255 for the highest result. That is why, we shall focus only on the limits which interest us in efficiency. 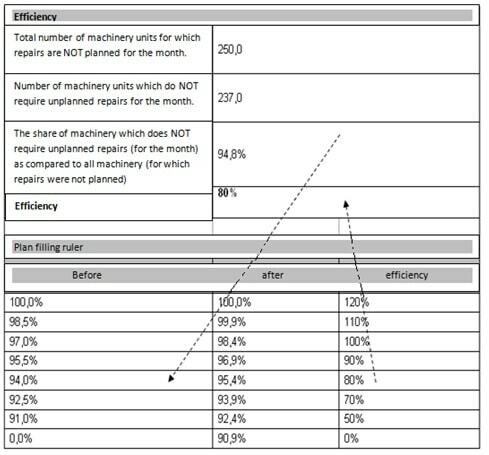 In order to stimulate the qualitative work of a mechanic at a garage, we can follow (for the current month/quarter) the percentage of machines which DO NOT require unplanned repairs as compared to all (those which did not have planned repairs). 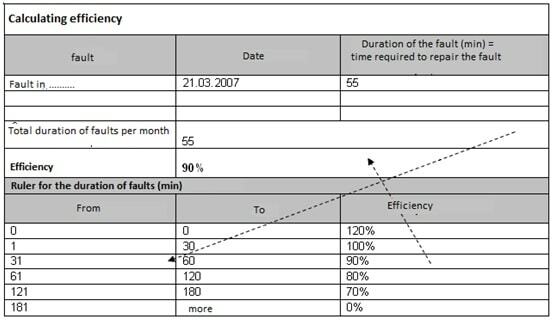 Hence if there are 300 units in the car park (50 of which are supposed have planned repairs for the current month and 250 are not), then in order to calculate the efficiency, the units which do not require repairs should be considered. The dispatcher at a bus park who is responsible for the transport of employees from the factory to their houses did not correctly set the time-table for the bus traffic. How to tie the salary of a dispatcher with the responsibility of such a situation? When considering certain faults, it is important to know their duration (more exactly, how fast the employee reacted and subdued the fault). … (this list can be easily completed by the Reader himself). The obtained efficiency (in this case - 90%) is multiplied by the calculated variable part. For example: 266 х 90% = 240 marks. The marks are converted into money. for a voluntary or involuntary creation of life? A mechanic working with measurement and automatic equipment and responsible for the full work of the equipment did not completely do the planned check of the correctness of the weights at the meat plant. As a result, a Client got a wrong part of sausages weight. After the call of the representative of the Client, the exact weight of the shipped product was defined and the incident was regulated. 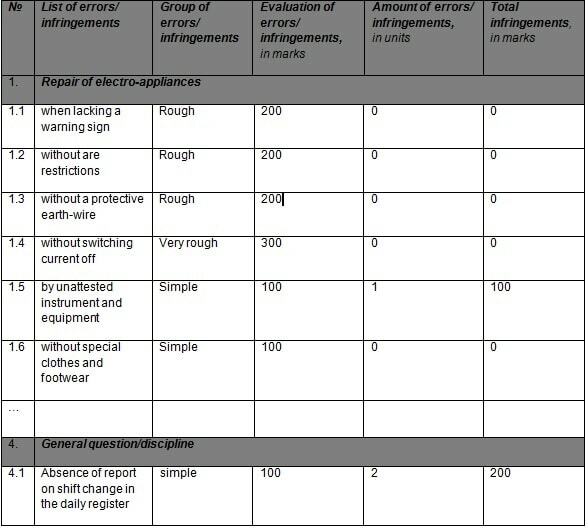 The metalworker answered that he inspects the work of hundreds of appliances and cannot "tear himself" on all of them. The director replied him: EVERYTHING which is linked to the Client has a special value. There are not hundreds of such appliances. And not checking them on time is NOT admissible. Maybe the Reader has already understood how to link the salary of the metalworker with his responsibility for such a situation. These situations differ from the earlier ones in the fact that they have a value or "weight" from which the efficiency is calculated. We hope that the Reader has noticed that in this table, just as in the previous ones, are considered not only punishment (in the form of a decrease in efficiency less than 100%), but also a prize (for 120%). Will there be happiness if the salary is linked to clear water, a well repaired tractor, an exact (up to milligrams) weight or "with whatever is required"? It is obvious that the mechanic can simply sell new spare parts and replace them with used ones. And the metal-worker can collude and regularly "tighten up" the balance. Yet, the constant tracking of efficiency for QUALITY, ABSENCE OF DEFECTS, WORK WITHOUT FAULT etc. works well though slowly. Within half a year, there will be enough statistics to give an understanding, not only about how the work is done and by which employee, but also, which "non-salary" problems the company will have to solve in the near future. Since "what we want to consider for motivation" often is the "bottleneck" of technology. The salary induces an order, because the employee fairly does not intend to be responsible for technological faults and work not completed by other departments, for decisions no taken by someone and expired promises, for the old car-park; for the rusted pipes with holes; for the unfinished warehouse program from the contractor. The method is called the "Magnifier" since we focus our attention on the needed part and do not consider all the results – from zero to infinite. I.e. what is beyond this range is not considered at all (in the same way as we are only interested in the range from 34 to 42о on a thermometer , since beyond this range, the patient is simply dead). We ensure that this part is most "sensitive". The author thanks Sychev S., Vladimirova G., Tkalich K. (from "TRIZ-CHANCE") for their help in working on the article.